Most of the forest (72.8%) lies in El Dorado County. In descending order of land area the others counties are: Amador, Alpine, and Placer counties in California; and Douglas County in Nevada with 78 acres (320,000 m2). The forest is bordered on the north by the Tahoe National Forest, on the east by the Lake Tahoe Basin Management Unit, on the southeast by the Humboldt-Toiyabe National Forest, and to the south by the Stanislaus National Forest. Eldorado National Forest headquarters are located in Placerville, California. There are local ranger district offices in Camino, Georgetown, Pioneer, and Pollock Pines. A complicated ownership pattern exists. The parcels of Other Ownership (private or other Agency land) are mostly isolated and surrounded on all sides by government land. An opposite pattern occurs outside of the Forest Boundary where several small scattered pieces of National Forest lands are separated from the main body and surrounded by lands of Other Ownership. The Forest ranges in elevation from 1,000 feet (300 m) in the foothills to more than 10,000 feet (3,000 m) above sea level along the Sierra crest. The mountainous topography is broken by the steep canyons of the Mokelumne, Cosumnes, American, and Rubicon rivers. Plateaus of generally moderate relief are located between these steep canyons. The Desolation Wilderness is located within the forest's boundaries, as is most of the Mokelumne Wilderness (which extends into neighboring Stanislaus National Forest and Humboldt-Toiyabe National Forest). A cool montane version of Mediterranean climate extends over most of the forest with warm, dry summers and cold, wet winters. Annual precipitation: 40 to 70 inches (1,000 to 1,800 mm) on average. Precipitation falls mainly from October through April. Temperature range: 0 °F (-20 °C) in winter to 100 °F (38 °C) in the summer. Snow pack: 5 to 10 feet (1.5 to 3.0 m) on average, can be as high as 15 feet (4.6 m) . Snow is present from December to May at elevations above 6,000 feet (1,800 m). A wide variety of hardwoods, conifers, shrubs, native grasses, and forbs are represented in the various Eldorado National Forest ecosystems. The major commercial Forest species are White Fir, Red Fir, Ponderosa Pine, Jeffrey pine, Sugar Pine, Douglas Fir, and Incense Cedar. Water is a major resource of the Eldorado National Forest. The forest receives about 56 inches (1,400 mm) of precipitation annually. Average annual runoff is about 29 inches (740 mm). This is equal to an annual water yield of 2.4 acre feet (3,000 m3) per acre (737,000 m³/km²); therefore National Forest lands yield an estimated 1,444,000 acre feet (1.781×109 m3) annually. 611 miles (983 km) of fishable streams in four major drainage systems: Middle Fork of the American River (including the Rubicon), South Fork of the American River, Cosumnes River, and North Fork of the Mokelumne River. 297 lakes and reservoirs (including both public and private land), which total 11,994 acres (48.5 km²). 11 large reservoirs account for 9,000 acres (36 km²). The rest are mostly small, high mountain lakes. The Eldorado National Forest has a high density of transportation routes, with 2,367 miles (3,809 km) of roads, and 349 miles (562 km) of trails. Roads under Forest Service jurisdiction total 2,158 miles (3,473 km). There are 209 miles (336 km) of county roads, and 400 miles (640 km) of private roads within the National Forest boundaries. The forest was established on July 28, 1910 from a portion of Tahoe National Forest and other lands. The forest was formed by the last ice age. ^ Davis, Richard C. (September 29, 2005). "National Forests of the United States (341 KB)" (PDF). The Forest History Society. 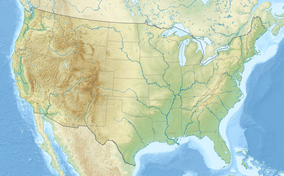 Wikimedia Commons has media related to Eldorado National Forest. This page was last edited on 21 November 2018, at 18:20 (UTC).